Scientists have discovered fossilised bones in Madagascar suggesting the existence of a 24-ft long Tyrannosaurus Rex like Crocodile, that roamed the African Island some 170 million years ago and on its hind legs. Yikes! So, is this just myth and cryptozoology or is it in fact, science? The size of this beast was about half the width of a basketball court. Well, the bones found would suggest that the scientists are onto something, since they found the bones of a reptilian beast that would eclipse the modern-day cousin crocodile in size and lethalness by a country mile. Yes, in Jurassic Madagascar, this beast was top of the food chain and a lethal predator, that could snap anyone and anything at the closing of his jaw. It not only scavenged on carcasses like a vulture but also hunted its own prey both in water and on land, making it a natural-born killer, sort of like Mickey, from the killing duo Mickey and Mallory. The origin and early evolution of the crocodile was not known much about until now, and its giant cousin is or was simply known in folklore legend as Notosuchia. 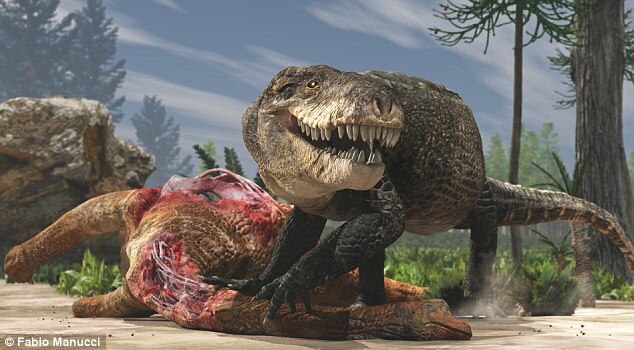 However, a new study of newly discovered fossilised remains by French and Italian palaeontologists led by the Natural History Museum in Milan, have started to narrow the million year gap of the crocodile lineage. 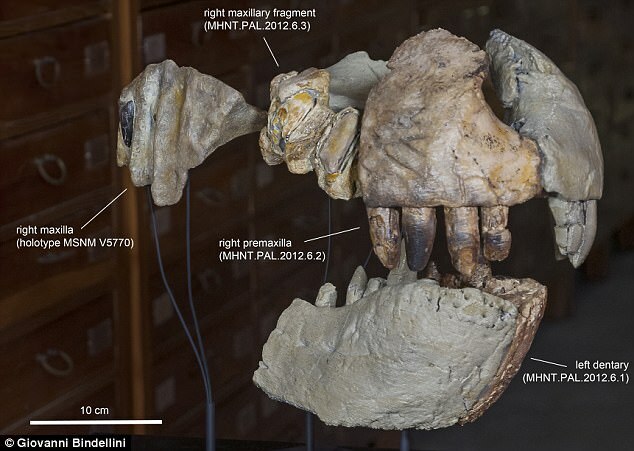 The teeth of this beast named Notosuchia, was similar to that of a T-Rex, so this is pretty much what you’d be encountering if you ever met one face to face. If there were indeed giant people (Nephilim) or fallen angels or other human like entities on planet earth way back then. Who knows? So, you better ask those guys on Ancient Aliens, we suppose? The findings by the palaeontologists found that their teeth were very worn out, suggesting their contact with hard food, so perhaps, they’d crack a sea turtle in half or just crunch down and wear out the enamel of their gnashers in whatever way they wished, right? This fearsome creature was both an opportunist vulture and a vicious hunter by trade and the creature was also nicknamed “Razana”. Yes, quite the exotic name and it was nicknamed “Razana” by the indigenous people of Madagascar’s Sakalava region, but its full title was “Razanandrongobe Sakalavae”, which means “giant lizard ancestor from Sakalava region”. Almost like a phrase that you’d expect to hear from the film Ace Ventura: When Nature Calls, but this is in fact, non-fiction and it’s embedded in the culture and folklore of the Sakalava people! “The phylogenetic analysis also reveals that R. Sakalavae is a valid species well-distinct from any other currently known member of Notosuchia” said Cristiano. So, there you have it, it’s definitely not a mystery of Cryptozoology but science backed by folklore legend and also fossil bones. How about that for some Jurassic News, to diversify your day. Keep coming back for more intriguing news here at Brainstain. Buy Lake Placid here for your Big Croc Fix!